Disappointed by how far your money goes and that you don't have access to some of your favorite neighborhoods? The homeowners in your favorite hood may have thought the same thing when they purchased that house many years ago. The best way to get into the market is to target an "up and coming" area, which they likely did. "Buy the worst house in the best area you can afford" is something your parents likely advised you to do. A companion to this advice is my "Look for where buyers will be moving next.". While I can't guarantee which area will boom next (much like your investment advisor can't guarantee investments), areas that become popular have certain characteristics you can look for. 1. They are close to a mature neighborhood with higher prices. As new homebuyers are priced out, they look to nearby areas with similar characteristics. A great example is the Silver Lake area, which had priced-out homebuyers targeting the Highland Park and Echo Park area. Those two areas have seen astronomical gains in home prices. If you bought between 2007 and 2013 in Highland Park, you likely saw your home value at least double. Homebuyers love amenities close to their homes, whether it be chic cafes, cool shops or an amazing new grocery store. The Americana at Brand has revitalized many parts of sleepy Glendale, an area previously overlooked by young, urban families. The Grove shopping complex added value to the many duplexes south of Beverly, with walking distance to shops and restaurants a coveted rental asset. I remember when large two bedroom duplexes rented for a mere $1,200/month, with those same units now renting upwards of $3,000/month. Similar areas south of that area haven't had such dramatic increases, despite a similar drive to many westside places of employment. 3. Transportation options are opening up. The new Expo line has opened up neighborhoods for those working on the west side, who can now jump on the Expo line in Mid-City and end up in Santa Monica in a mere 25 minutes. Prices in areas west of Culver City are steadily rising, with flippers providing turn-key homes to busy professionals not up for the headaches of a long renovation. Now that you know what to look for, buck up and get excited about the gains in home value you'll be making! Yes, you may have to wait a while for a cool cafe within walking distance, but you'll also have bragging rights when it finally does open. "I was here when there was nothing!" Let's explore some great examples of LA's most vibrant undiscovered (by most!) areas. If you love South Pasadena, try El Sereno. Quiet, historic home and great schools. If you love Mid Wilshire or Cheviot Hills, try View Park, West Adams, Midcity Village, Leimert Park or Park Hill Heights. Historic homes, more square footage and quiet neighborhoods are just a hop, skip and jump from the Westside. If you love Highland Park, try Lincoln Heights or City Terrace. Views for days, it's close to freeways, and you'll appreciate the affordable urban, multicultural grit. If you love West Hollywood, Hollywood and Culver City, you'll love Jefferson Park and West Adams. With a tradition rooted in the Arts and the decor trade, these much more affordable alternatives offer opportunities to get in on the ground floor and renovate a charming older housing stock. With so many lofts and offices housed in brick warehouses along Jefferson Blvd, this area will boom before long. Imagine if you had bought a two bedroom bungalow in the 1990s in Weho, and you'll get a sense of the opportunity. Throw in a train to the beach, and you have few excuses not to see how fabulous this area is. 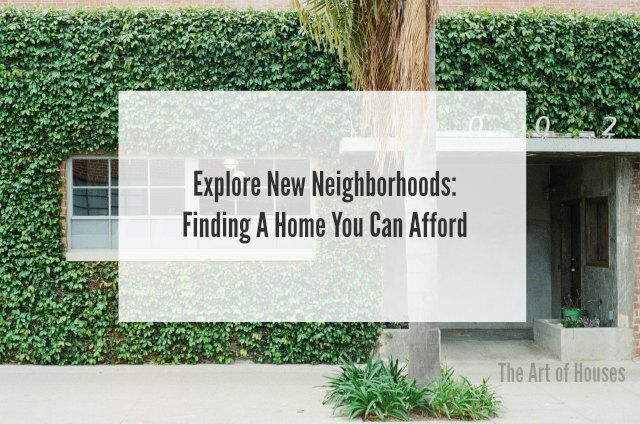 While folks with quite healthy salaries grumble about being priced out of the LA market, they're missing the opportunities in wonderful, welcoming neighborhoods outside of their comfort zone. The new Metro lines are opening up both transport options and people's minds. Happy House Shopping! Worried about your school options in these areas? Learn more about your options for public schools.